Naval And Military Map Of The United States. 1 : 3300000 Smith, Robert P.
Washington Map of the United States. 1 : 13000000 Taintor, S. & Co.
Map Of The United States, Canada, Mexico, Central America, West Indies, &c.
1 : 3380000 Williams, G. Washington. Map Of The United States Of America. 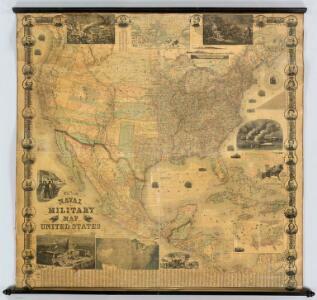 1 : 16526080 Colton, J. H.
Colton's Railroad and Military Map, United States. 1 : 6500000 Colton, G.W & C.B. Our Country, Present & Prospective. 1 : 3801600 Gaston, Samuel N.
Our Country Present And Prospective. 1 : 3168000 Gaston, Samuel N.
Composite: Vereinigte Staaten von NordAmerika, nebst Mexico und Centralamerika. 1 : 7000000 Stein, Christ. Gottfr. Dan. 1 : 3041280 Colton, J. H.
Map Of The United States, Canada, Mexico, Central America, and the West India Islands. 1 : 12500000 Atwood, J.M. 1 : 3000000 Taintor, S. & Co.
United States ... Texas ... Mexico and Guatimala. Map of the United States and Texas ... Mexico and Guatimala. United States, Mexico, Central America, Caribbean. Map Of The United States The British Provinces Mexico &c.
1 : 14000000 Colton, J. H.
Map of the United States of America, the British provinces, Mexico, the West Indies and Central America, with part of New Granada and Venezuela / map drawn by Geo. W. Colton ; engraved by John M. Atwood ; border desig'd. & eng'd. by W. S. Barnard. Continental Map Of North America. 1 : 3801600 Colton, J. H.